A huge struggle for teachers at the beginning of every year is to get students out of the gates and engaged in authentic, meaningful work. Between establishing classroom routines, getting a sense of and organizing each learner and trying to clear the cognitive cobwebs that form over the summer, the first few days of school can be a bit slow from an academic perspective. One way that I have been trying to combat this is to have the teachers that I work with view and discuss pictures with their students instead of written text. Replacing written text with artwork, photographs, or illustrations offers a number of advantages, especially early in the school year. Visual imagery is very accessible and a lot less intimidating to a wide range of learners including non-readers, struggling readers, and English language learners. This enables these students a greater chance to practice some of the forms of complex thinking that they will need as the year progresses such as using text evidence, identifying theme, and making connections. Additionally, because of the accessibility that visual images offer, they can provide a greater chance of more students participating in the group discussion. 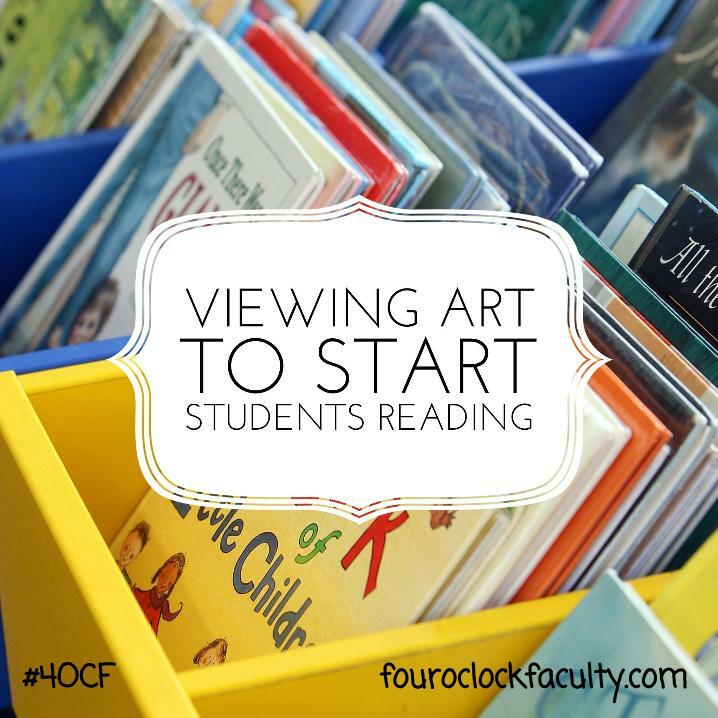 Even for strong and confident readers, viewing and discussing pictures is a great way of getting these students back into the groove of engaging in rich, meaningful conversations geared towards making meaning. 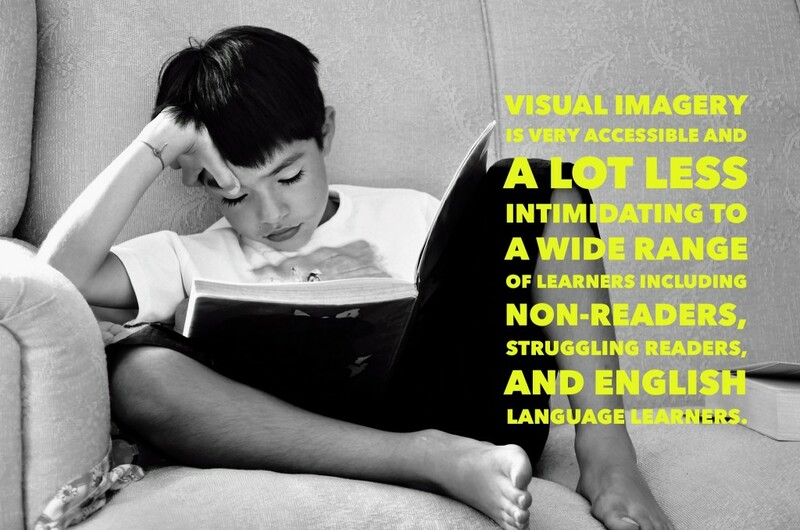 One reason this is true is because images are static, which means that students don’t need to invest a lot of cognitive energy in recalling previous information, the information they need stays right in front of them. Another advantage the visual imagery has over written text is that it is very fast to decode. This allows discussions to happen very quickly which can be a real benefit when students are still getting used to sitting for longer periods of time. This is also a benefit because viewing and discussing artworks can be squeezed in between all the other things that have to be done at the beginning of the year or when there is a ten or fifteen minutes of unexpected dead time because something didn’t take as long as expected. 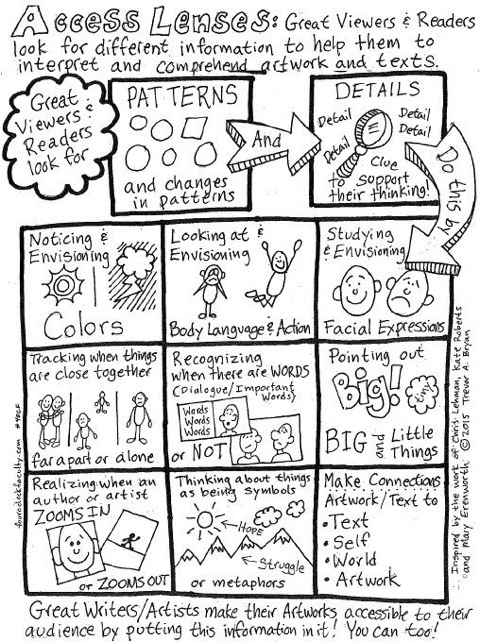 To help you get started using artworks to launch your students’ academic thinking early in the school year, have your students use my Access Lenses to help them look for the things that will allow them to make meaning from the picture and expand the conversation. You’ll notice that the Access Lenses which help your students find the information when viewing are the same lenses that students should use to find information when reading or close reading. Once these Access Lenses are familiar to your students, they can be reversed to support writing, a process which I sometimes refer to as “close writing.” In other words, instead using the Access Lenses to pull information out of a text, the Access Lenses can be referenced to help students to put information into their writing. You can also check out The Six Things We Teach to help you guide the viewing conversation. Artworks can and should be treated just as a written text. By doing so, students can get their academic thinking started early, laying a foundation for them to build on throughout their school year. Check out the remainder of our #BackToSchool Resources. Great post. I really love the cartoon. Teachers should consider putting it on the wall. How about a list of great art for teachers to consider using. I would start with Millet’s “The Gleaners”. Look for this posted today at http://DrDougGreen.Com. Keep up the good work.